Kladder Update: Valentines Day, Birthdays & Back in N.Y.C. Hello lovers! How were your Valentines Day celebrations? February has come and gone but not before Jeff and I were able to celebrate Valentines Day together. We had a great time with friends at X Golf Grand Rapids playing virtual Pebble Beach Golf Course. Virtual golf is odd in comparison to real life golf. You still swing your own clubs at a real ball into a screen that measures your play, but the adjustment from real to fake as it hits the screen is certainly something to adjust to. Our golf date was a surprise to the gents in the group (props to us ladies for planning a dude approved date) as was the sushi dinner and drinks before hand at Ju Sushi & Lounge. I also got to celebrate GALentines Day with the wives of Rosewood. About once a month we take turns hosting one another for wine and snacks, and to catch up on life. Winter wine nights are especially important because our neighborhood tends to hibernate during the snowy months. But these last few days have certainly teased us all out of our houses and the sidewalks are filling up once again with all the wheels and colorful sidewalk chalk. Last week Jeff and I joined our friend Allison Rudi for the inaugural Mind Meets Music fundraiser at St. Cecilia Music Center. Mind Meets Music is an academic achievement program using music to improve literacy and brain development in children. Allison sits on the board of MMM and chaired the event that was catered by Martha's Vineyard (a favorite of ours). We were happy to support her and the organization by doing what we do best: drinking wine! Jeff and I at Mind Meets Music fundraising event. Big news in mom land, I've completed my duty in round two of breastfeeding! 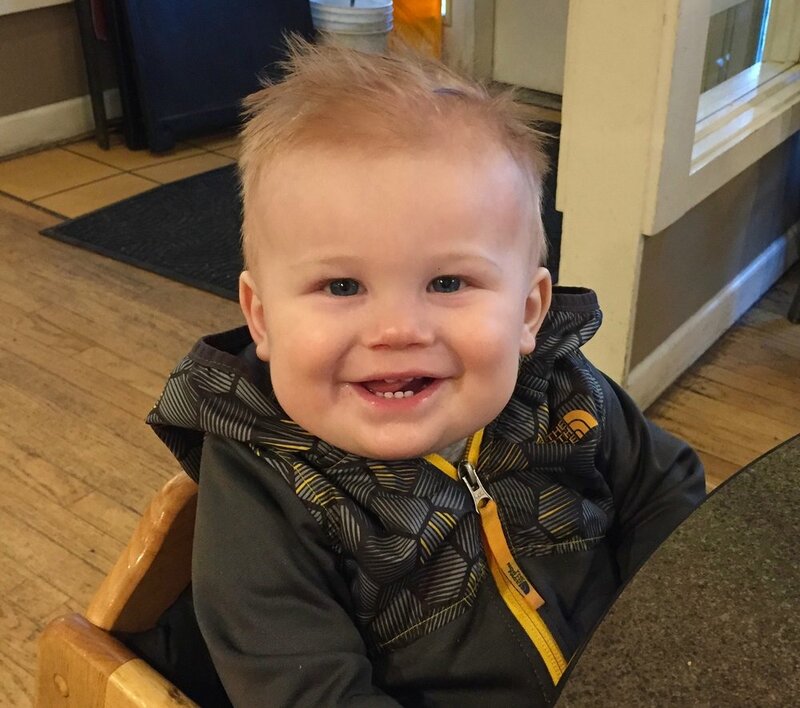 Thomas hit the 11-month marker this week and from here on out we'll coast on stored milk. Good news is that I've got my time (and my body) back! Bad news... the girls shrunk right back to their (good) ole' selves. You did good ladies. Thomas is so-so busy these days - he wants up and down then back up and then all over everything. He's pulling himself up to standing now and this morning upon opening his door to start our day he greeted me with a full smile obviously pleased he was up on his feet. He had his first haircut two weeks ago and hated every minute of it. Thomas hanging out a Big Bobs in Gaslight Village. Natalie is all girl (nothing new there) and is likely in on the cusp of a growth spurt because she's eating dinner and then less than 30 minutes later asking for more dinner. Pretty much daily now she asks if she can go to school (soon girlfriend... very soon!) and the magic word for her (and us) these days is 'princess.' Example: "Hey Natalie, ready to put PJs on?" ... "Nope." Versus: "Hey Natalie, ready to put your princess PJs on?!" ... "Yes!" This probably won't work for Thomas. Making birthday cheesecake for Grandma and Aunt Rachel. Two weekends ago we spent Saturday night at my folks house in Schoolcraft celebrating both my sister-in-law Rachel's birthday and my Mom's birthday. We kicked off the celebrations like we do most events in my home town by having cocktails at the local American Legion. The kids ate PB&Js at the bar (in between the cookies the bartender and other patrons kept sneaking them) and my brother kept Natalie busy playing pull-tabs and pressing buttons on the jukebox. Later we headed back to my parents for dinner - my Dad always makes the most incredible meals - and I've fallen into the habit of providing the dessert. This time I made something new: Sopaphilla Cheesecake which is a cinnamon twist on cheesecake. So easy. So good. The birthday girls: Rachel and Mom. I was back in New York last week for work shooting a video featuring some of our more residential office settings. We highlighted some of our partnerships including Mitchell Gold & Bob Williams, Flos, Viccarbe and Blue Dot. The shoot in NYC was followed by a long shoot day back here in Grand Rapids using two of our newest showroom spaces on our 44th Street campus. I'm pretty thrilled about the work we accomplished and eager to share the finished product. Looking ahead to March we've got a busy 4 weeks including Thomas' first birthday, new evening church services, broadway, butterflies, a trip to Chicago and so much college basketball. Hoping for more spring weather and... hey you guys... GO BLUE! Library Cards! I got my very first library card last week at the East GR Kent District Library and I'm pretty jacked about it. So nerdy. I'm halfway through my first borrowed book: Parenting with Love and Logic (which is a pretty solid read by the way) and I've heard great things about the kids events they host there - looking into it more! Big Bobs Pizza in Gaslight Village. Still a go to for us with the kids on a Friday night with friends. 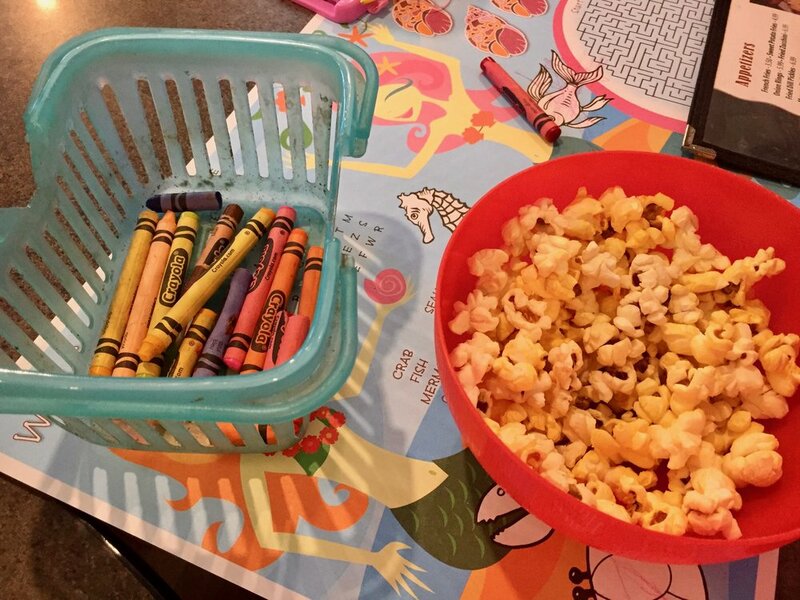 Free popcorn, crayons and the kid to adult radio is one is about one to one - you belong there. We also really like the pizza. Dirty Money documentary series on Netflix. I've been traveling for work and these have been what I've killed my time with. All true stories about money that's made that's 'dirty.' I've watched the one on Volkswagon and how they cheated the gas emission testing, the story about the racer car driver Scott Tucker and how he made money off sketchy money lending and the latest one I finished was about shorting the drug market. Also very nerdy, but extremely interesting.